GoodReads Summary: Who would rock the mic at karaoke night? Abraham “The Great Emancipator” Lincoln or Jane “Lady Persuasion” Austen? How about a hot dog eating contest between Harry “Mr. Magic” Houdini and Mary “Mother of Frankenstein” Shelley? What about a pie contest? A staring contest? And who has a better chance of sneaking into Area 51, Isaac “Gravity Guy” Newton or Sacagawea aka “The Pathfinder”? In Who Wins? 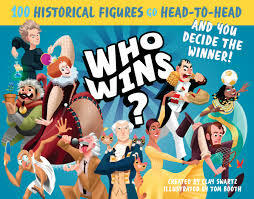 : History, you decide the winner in over 50 head-to-head challenges between 100 of history’s most illustrious characters. But choosing the victor isn’t arbitrary. 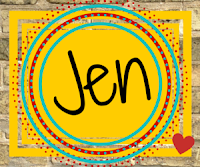 Readers must justify their answers using each of the historical figures’ six 0-10 category rankings in bravery, leadership, artistry, wealth, wisdom, and fitness; as well as facts from short biographies. As funny as it is informative, the book is uniquely formatted so readers can match up each and every character in any of the head-to-head battles. History has never been so much fun! What I Think: We had a blast learning about famous people in history and thinking how they might match up to other historical figures on some pretty random face-offs. As a mentor text, this could be a great way to get students thinking about argumentative writing. They would have to choose who might win and defend their thinking. The book gives each person a score in terms of six different rankings. Sometimes the scores correlate to the battle and sometimes you have to use your own thinking to come up with reasons why one person would win over another. It really forces you to think critically about what you know or just learned about a person and how that compares to another person's skills. As a mentor text, I really love how this might get writers' thoughts going but it's also an example of writing a short summary of a person's accomplishments. I've learned that succinct writing is hard to do but powerful. Students might write what they've learned about a person and then try and cut down the number of words they used by half to get to a super specific and concise summary of that person's accomplishments. Writing Prompt: Choose one of the match ups. Share who you think would win and use evidence to defend your decision.